V FOR VICTORY Eleanor Parker of the movies is another extremely patriotic American girl. So, when she chose a gown with a V-for-Victory neckline, she naturally selects one whose V is nothing else but. 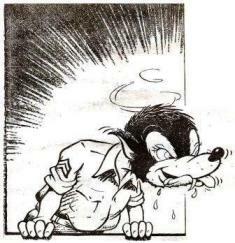 Well, fellas, we got WACS! SALAAM You may think Capt. Elizabeth M. Lutze of the Women's Army Corps is too pretty to be a soldier, but those who have met her already know better. The Roundup respectfully salaams to Capt. 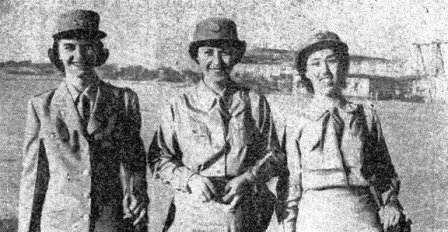 Lutze and the two enlisted WACs who arrived in the C.B.I. Theater with her, and only hopes there will be many more like them. came in, but he can't talk and we don't know anything so lets talk about the WACS. All we can say about the general is that he's a big, grey-haired, good-looking guy who was quite a hot shot with the War Department. The photographers took about one shot of him and then spotted the first WAC and that was the last attention the general got. 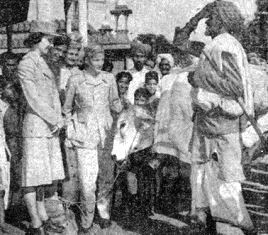 The first WAC to set foot on India soil was Capt. 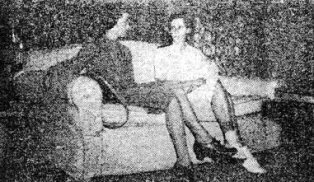 Elizabeth M. Lutze, a neat, trim-legged gal who was once aide to Col. Oveta Culp Hobby, mamma of all the WACs. She was followed by T/4 Theresa A. March and T/3 Louise E. Hull. The day after the WACs arrived the Public Relations Office lined them up in two groups for an afternoon of picture taking in and about the town and inadvertently got mixed up in a comedy of errors that saw the intrepid cameramen breaking into a Mountbatten lunch by mistake and losing the two enlisted women in GHQ. The former brought a hasty retreat to positions which had not been previously prepared and the latter resulted in a rat race through the cloistered halls of the Secretariat, which gave the resident British a new appreciation of the need and functions of a Section Eight Board. There are more WACs on the way - all consigned to SEAC - and for more dope on the arrivals scan the picture section and read . . . The Roundup never officially loses a campaign and we campaigned for WACs. We ought to claim a victory on the arrival of the three who are now sweating it out in New Delhi but we'll have to be honest and only call for a draw. Although these lovely creatures are in India, they don't belong to us. They belong to the Southeast Asia Command and wear a Phoenix emerging from a sea of fire on the left shoulder instead of the CBI shoulder patch. This is a very tragic thing. If you remember, we particularly asked for WACs, preferably full blown blondes, to stroke the fevered brows of air crews returning from bombing missions. All we wanted in Delhi was a couple of the gals for window dressing in the Roundup office. Our motives were not social. We wanted to relieve a couple of our boys for combat duty and we needed a couple of experts to guide us along the proper WAC policy line which is alleged to be a strange and sometimes varied one. It is rumored that more of these efficient young women are on the way. Again the old adage that "all good things come to those who wait" is disproved and the SEAC gets the gravy. 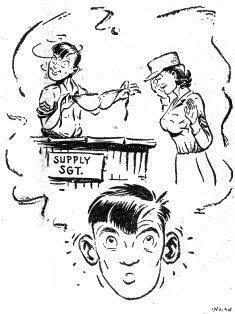 We're very upset about this because we remember the letter which one GI sent, in which he offered the pious hope that some day he would become a supply sergeant for the WACs. He was thinking in terms of outfitting the girls with personal wearing apparel and wrote: "Boy, would I like to hand a dainty piece of femininity over the counter and say 'try these water wings on for size.' Wow!" CPL. WOLF EYE - WACS! until the identity of the person answering is positive. Members of the Roundup organization had the privilege of escorting the three strangers about Delhi for one afternoon. The ostensible purpose of all this was to gather together photographs for publicity purposes. In actuality, however, the motives were more subtle. As Corp. Eddie Jankowski, one of the Roundup's All-American photographers put it: "I think we ought to get in on de ground floor." If Eddie's wife reads this she should be informed that we are only kidding. She should also know that Eddie made an impression, whether he tried or not, as he is indeed a gorgeous hunk of Polish man. The grapevine has it that the WACs, so far, are a bit standoffish socially and sticking strictly to business. The glad rags and the bright lights are not for them. Their purpose is a serious one. In this connection we wish to predict that a couple of good cases of Delhi Belly and a nice mosaic of prickly heat will bring a rapid change. Having watched arrivals from Washington for about 20 months, we know that Delhi Belly is the basic common denominator and the greatest leveling influence of India. Maj. Gen. Albert C. Wedemeyer has arrived in CBI to be Deputy Chief of Staff for the Southeast Asia Command. Greeting him in the photo below are Col. E. P. Streeter, Deputy Chief of Staff for Maj. Gen. George E.
Stratemeyer, and Capt. Michael Hodges, Royal Navy, representing Lord Louis Mountbatten. Center is Capt. B. G. Rodgerson, U.S.N., who accompanied Wedemeyer while the general's right shoulder almost obliterates the handsome map of Col. John C. Blizzard, who also arrived with the new staff officer. Wedemeyer got a rapid shuffle from the photographers who took two shots and mobbed the WACs, three of whom came in on the same plane. With the arrival here this week of Viscount Archibald Wavell, new Viceroy-designate of India, preceded a few days earlier by Lt. Gen. Sir Henry Pownall and Maj. Gen. Albert C. Wedemeyer, the cast of actors is now almost complete for the drama of Southeast Asia which all signs indicate will shortly be unfolded. Wavell, former commander of British forces in North Africa and more recently Gen. Sir Claude Auchinleck's predecessor as commander of British forces in India, succeeds Lord Linlithgow as Viceroy. His will be the responsibility for maintaining a unified home front in India when Lord Louis Mountbatten leads his expected attacks on Burma and Malaya. Pownall, who will serve as Mountbatten's Chief of Staff, has had plenty of fighting experience, first at Dunkerque and later in the defense of Singapore. This week hardly a target between Rangoon and Sumprabum was neglected by the Tenth Air Force. It was no picnic - we lost four ships - but the damage wrought upon enemy supply points and bases, the disruption of communications and the obliteration of North Burma air bases was heavy. Rangoon again furnished one of the principal targets (the Irrawaddy Flotilla Company) and the strongest opposition. Our Liberators got into an hour-long scrap with a dozen Japanese fighters, three of which were definitely accounted for, three probably destroyed and all but two of the remainder damaged. One bomber did not return from the scrap. No less than 20 objectives were on the Tenth Air Force agenda on Oct. 11. The rail yards at Sagaing and Nyaungbinwun (Mandalay area) were struck with telling effects on trackage, rolling stock, docks and boats. On the 12th, Mitchells attacked the rail yards at Minzu, 30 miles south of Mandalay, ripping up tracks and cars and starting fires in adjacent storage buildings. QUADRUPLE CHEESECAKE The beautiful thing about this picture is that it makes equal sense, no matter how you hold it. So you're really getting four different cheesecakes for the price of one. Or, if you prefer, the beautiful thing about this picture is Evelyn Ankers, a Universal Pictures starlet. on the terminal and a fire visible for 130 miles, was started in a material dump. Liberators visited Toungoo and Prome. At Toungoo, a rail junction point on the Rangoon-Mandalay mainline, an engine shed was half demolished in addition to the usual damage to rails and warehouses. Oct. 14 was the day of the Rangoon fight, but in addition, another formation dealt a severe blow at the Prome rail yards, causing a large explosion. Farther south, at Henzada, their hits in the storage area resulted in many explosions followed by fires. The railway yards at Kemmendine, a suburb of Rangoon, were also blasted. Off the coast, on Ramree Island, enemy barracks were attacked at Kyaukpyu, but results were obscured by clouds. The same day, Mitchells successfully attacked Thabeikkyin, a ferry crossing on the Irrawaddy, 30 miles north of Shwebo. Twelve to 15 warehouses were destroyed by fires. The dock area at Kyaukmyaung was hit repeatedly, with heavy damage to buildings and boats at the landings. Naba Junction was given no breathing spell. On Oct. 15, Mitchells pounded more trackage and rolling stock; two direct hits resulted in a large explosion. The sugar mills at Sahmaw, 100 miles north of Bhamo, were heavily damaged by other formations. Numerous hits were observed on the main buildings and on rolling stock parked on a siding. Oct. 16 and 17 saw Liberators, Mitchells and fighter-bombers in action over a wide area. On the 16th, our mediums hit enemy shipping at Katha with excellent results. Three boats 200 feet long received direct hits and six or eight smaller craft were destroyed. Another formation dropped 10 tons of explosives on the landing ground at Bhamo, in Northern Burma. All bombs were in the target area and numerous hits were made on runways. Accurate observation was hampered by clouds. On the same day, Mitchells and fighter-bombers participated in bombing and strafing attacks at Thetkegyin, 125 miles northeast of Mandalay, where three storage buildings were left burning. Several hits were made on Japanese installations at Kamaing, 45 miles east of Mytikyina. The headquarters and radio station at the northern Japanese outpost of Sumprabum were attacked on both days, with unobserved results. Three of our ships failed to return from these operations. Also on the 17th, formations of mediums and heavies threw more heavy stuff at Naba Junction. Results of the first attack were unobserved because of weather, but later formations dropped more than 40 tons of bombs smack on the target, with heavy destruction to trackage, rolling stock, and adjacent storage buildings. Arrival - Capt. 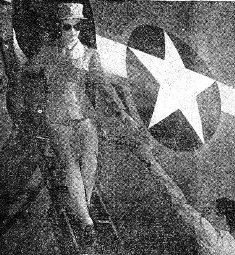 Elizabeth M. Lutze, of the WACs, descends from her plane to be the first woman soldier to plant her tootsies on the soil of the C.B.I. Theater. She hails from Sheboygan, Wis.
Army Corps - Here it is, the Woman's Army Corps of Southeast Asia, all three of it. Capt. Lutze, left, is flanked by T/4 Theresa A. March, of Chicago, center, and T/3 Louise E. Hull, of Smethport, Pa. Hands Across The Sea - Capt. 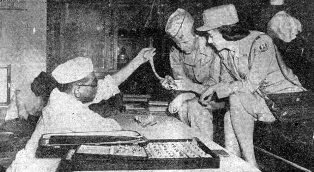 Lutze is welcomed to India by First Officer Heather Hayes, her counterpart in this Theater in the British WRENs, with whom she discusses military matters from the feminine angle. Captain Meets Captain - For photographic purposes a search was made for a bachelor and Capt. Sam B. Bohannon, of Atlanta, Ga., drew the lucky number. Baaksheesh - An Indian beggar, quick to recognize the U.S. uniform even on a woman, whips out that familiar cry of "Baaksheesh," while Capt. Lutze studies Indian transportation facilities. Shopping - Well, it's the same wherever you go. As any husband or father can tell you, the first thing any woman wants to do anywhere is to spend some money. More Shopping - Not to be outdone, the two G.I. WACs also beat a path to a local vendor's door. We hope they got out without spending all of next month's paycheck. Revelry By Night - the WACs have landed and already have the situation well in hand. S/Sgt. Gilbert Langton, left, and T/5 Francis Alvis are the G.I. gallants. And So To Bed - It may be a tent, but it's home for the moment for T/4 march. Don't ask us what she's holding. We couldn't figure it out, either. Not to be outdone by the recently organized New York club in CBI, New Englanders, headed by Pfc. 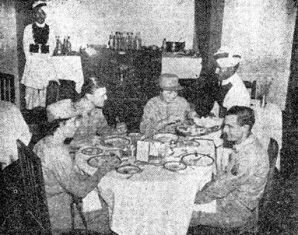 Robert L. Gladu, of New Hampshire, and Miss Flora Coutts, ARC hostess from Vermont and former member of the State's legislature, the group held a dinner last week at a Delhi restaurant. Stories were told of Maine lobsters, Boston Beans, Vermont maple sugar and vacations in New Hampshire. Guest speaker was Mr. Gerry Tracy, American Red Cross director from Hartford, Conn. Massachusetts was represented by Pfc. Harold P. Fleet. The group resolved to hold a dinner somewhere in New England after the war. They also hoped that similar clubs will be formed throughout CBI-land. ANIMAL MONSTROSITY This, class, is a flying fox, so called because it flies and looks like a fox, even down to the fur. We publish the picture as part of the Roundup's "Know India Better" campaign. T/Sgt. Jack Nolan, wacky creator of Corporal Gee Eye cartoons, holds the animal monstrosity for your inspection. ASSAM BASE - Somewhere in Assam a mess hall burned down recently. As the flames licked their way into the part of the mess hall where the food was stored, the eyes of the surrounding G.I. 's lit with joy. Even those who were hard at work beating at the flames had happy expressions on their faces. The corned Willy was burning up. One soldier, who had looked as happy as the rest, suddenly groaned and tuned away muttering to himself. "That damned corned Willy - that damned stuff." Other G.I. 's cheered him up. "It's OK, Joe - the stuff is all burning up in there." "Yeah that's what you think. I moved it all over to that tent over there this morning." He pointed to a tent safely out of harm's way. The corned beef that night was very good, as usual. The "Sky Dragons," pioneer medium bombardment squadron of the 14th U.S. Air Force, have been blasting Jap targets in occupied China, Burma, and Indo-China for well over 15 months. What they have achieved during this period is a matter of record and has received acknowledgement in the newspapers and magazines back home. It is fitting, then, to see just what recognition members (and former members) of the squadron have been given by higher headquarters for their daring exploits against an enemy of much greater numerically superior forces. A total of 51 Silver Stars (with one Oak Leaf cluster), 15 Distinguished Flying Crosses (with one Oak Leaf cluster), 83 Air Medals (with four Oak Leaf clusters), and seven Purple hearts have been awarded to the boys who man the Mitchells. Ninety-seven officers and enlisted men have shared in these awards. T/Sgts. Douglas V. Radney and Adam R. Williams, both engineer gunners on the FIRST bombing of Tokyo, led by Gen. James H. Doolittle, earned themselves a pile of decorations before returning to the United States. Radney holds the Silver Star with Oak Leaf cluster and the Air Medal while Williams received the Silver Star, Purple Heart and the Air Medal. Both men were awarded the Distinguished Flying Cross for the Tokyo raid. 1st Lt. Charles H. Dearth, a bombardier on the Mitchells who hails from Sidney, Ohio, has received the Silver Star, the Distinguished Flying cross with Oak Leaf cluster, and the Air Medal. T/Sgt Charles H. Patton, an engineer-gunner from Dallas, Texas, has had the Silver Star, Distinguished Flying Cross, and the Air Medal with Oak Leaf cluster pinned on his tunic. 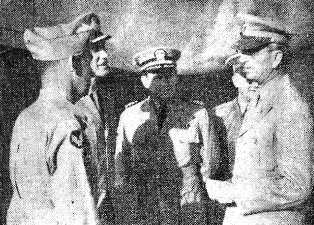 Patton received the Oak Leaf cluster for shooting down three Zeros confirmed and three probables during a raid by the "Sky Dragons" on the Hankow Airport - the largest number of enemy aircraft destroyed in a single aerial combat by any member of the organization, past or present. The 14th Air Force this week raided Japan's vital supply route around the China coast and the shipping lanes leading to it, as well as Japanese troop concentrations and supply dumps at Lukou in the Salween River area. On Oct. 13, a 250-foot freighter was bombed, with a direct hit scored that caused an internal explosion. The vessel sank immediately. Another 250-foot freighter was attacked with bombs exploding near the ship. Gunboats and sampans near the coast were also bombed. A day after this operation, B-25's continued their heavy attack. One 200-foot freighter was directly hit by a heavy caliber bomb and burned fiercely. A near miss was observed on a 150-foot gunboat in the same area, and it was probably damaged. Then the Mitchells blasted a 250-foot merchant freighter. One direct hit was scored on the vessel, with another bomb striking within five feet of the ship. The target was blazing when the bombers left. Oil storage dumps also were bombed with unobserved results. Three days later, fighter-bombers bombed Japanese troop concentrations and supply dumps at Lukou in the Salween River area. The bombs were put squarely in the target area, and many casualties were inflicted on the enemy personnel. 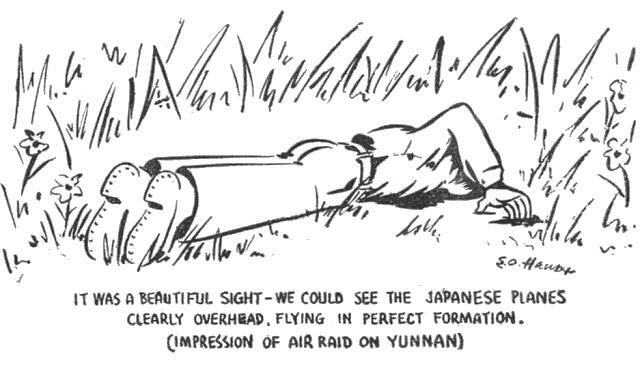 The Japanese bombed three undefended auxiliary fields in Eastern China. No U.S. planes were lost on these missions. One of these, Capt. Theodore Roosevelt Shapou, had really hit the jackpot. Three times his name was called as the Distinguished Flying Cross, the Silver Star, and the Air Medal were dealt out to him in rapid succession for combat flying in China. Tall, sun-bronzed Shapou, whom the general is shown congratulating in the picture, is Massachusetts born, but an unreconstructed rebel because of having been brought up in New Bern, N.C. He deserted a college career at Georgetown College in Kentucky, where he had starred in football, baseball, zoology and botany, for the Air Force, and served with a pursuit group in Puerto Rico before joining the 14th Air Force in China as a fighter pilot. "This is a proud moment," Shapou said, surveying his shiny new medals. "I'm not looking for recognition, but my three sisters, my wife and my parents, who all think I'm a hell of a guy, will get a big kick out of this." In addition to Shapou, Capt. Charles D. Jantzen, of Spokane, was awarded the Distinguished Flying Cross. Capt. Lawrence R. Durrell, of Scarborough, N.Y., got the Purple Heart and Capt. James D. Proctor, Jr., of Beaumont, Tex., received a Silver Star. 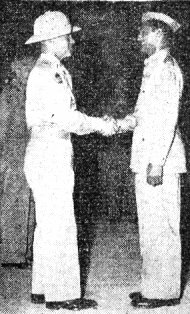 Air Medals were awarded to Capts. Robert B. Klemann, Hollis M. Blackstone and Robert F. Mayer; Lts. Robert Ellis, Gregory D. Carpenter, Samuel D. Berman and Stewart S. Sewell, and to T/Sgt. Earl D. Rhodes. Repairing airplanes forced down far from their home base is an old story to the Engineering Section of a Service Center in southeast India. Men of this section seldom get a thrill other than watching their finished product take to the skies and the satisfaction of knowing that their job was well done; but when they came back recently from a little job, they had stories to tell that made other members of the organization envious of their expedition. Word was received that a heavy bomber was down somewhere east of this station, and was in a hot spot, and had to be gotten out before "Velly Solly, Please" boys came along. Capt. Hugh A. Tate, Engineering Officer, turned to his assistant, Capt. Horatio J. Whitehead and said: "While I'm rounding up a transport, get yourself a crew and be ready when it gets here." T/Sgt. John T. Duke (our slit trench cavalier), T/Sgt. K. L. Lindsey, S/Sgts. 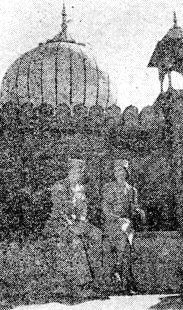 Muriel W. Emmons, Mac R. Mason, Allen R. Furhmann and Sgt. William R. Terbrugge made themselves ready for immediate call. They didn't have long to wait till their plane arrived, and it soon had them at their destination. Repair operations on the stricken bomber were commenced at once. Floodlights built by the Engineering Section at the home station were put into service as darkness approached and nimble fingers hammered, cut, shaped and smoothed repair parts till fatigue required their getting some rest. Throughout the next day and night they toiled. Two scrambles were sounded, but no bombs were dropped. Even so, they knew their pictures were being taken and the next visit might mean calling cards from "Tojo." WHAT'S WONG To get a little local color into our cheesecake, we offer some leg art on an old friend of the Roundup. 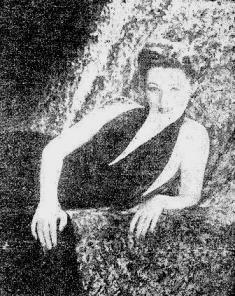 This is Mabel Wong, daughter of the legal advisor to the Sultan of Jahore. Mabel got tired of kicking the gong around New Delhi and is now working for the American Red Cross in Calcutta. the ingenuity of the crew already over-burdened by their race against time. Finally, on 48 hours after notification of the job had been received back at the Service Center, the crew watched with pride the successful flight-test of their "baby." All OK! With equipment packed, all they had to do now was wait for their "private plane" to come along and take them home. The transport didn't arrive, but thirty Jap raiders did. They came in at about twenty-thousand feet, looking for the now repaired bomber. From their positions in the slit trenches the crew counted at least ten ships shot down by fierce little Hurricanes, which went up to make their "look-see" job a little less than dull for the Nip visitors. The next three days were spent between bungalows and slit trenches - and still no sign of their transport. It was decided that if they wanted to get home they'd have to take the boat and it was sailing that day. Arrangements were made and everyone was happy, thinking of the many stories they could tell the boys back at the barracks, and the beautiful snow job they could hand the girlfriend in their next letter home. Even the best laid plans go asunder, however, for in came a medium bomber with engine trouble, looking for a doctor. It only took five hours to get the ship into the air again, but in the meantime their ride home had sailed away and they had more waiting to do. Again they had visitors, but this time they were more friendly and came in low, strafing the ground with machine-gun fire and making things in general very uncomfortable until the Hurricanes put them to flight. This was the stuff that grease-monkeys only hear about and seldom ever get to see. Fortunately, no one was hurt, but that thought of getting back still lingered in their minds. However, they had not been forgotten and their transport arrived the next day and happiness reigned supreme. T/Sgt. Duke is an honest man, and never would anyone accuse him of telling falsehoods or stretching the truth, but lately it has been noticed that when he begins: "Well, when I was at - ", the men who were there with him, gently and quietly, but hurriedly, roll up their trousers and quickly climb onto the highest box. 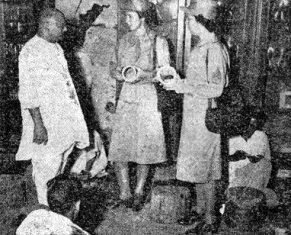 CENTRAL INDIA AIR DEPOT - Welcome addition to Red Cross personnel at this station are the Misses Montrose Philips and Benita Mossman, holding forth at "The Hangar" and Miss Louise Murphy, at the Station Hospital. Another newcomer is Mrs. Pamela Atkinson, attractive young Englishwoman who has also pitched in to help "keep up our morale." Sgt. Lacouteur, special services chief, deserves a lot of credit for the architectural job he did on the "Papaya Bowl," our new outdoor movie emporium. A really classy job, modeled on the lines of its Hollywood prototype, it almost makes us ignore those nine-or-ten-year-old shows we seem to be deluged with these days. Things must be getting tough in film land when they have nothing else to send us but "Tale of Two Cities" and "Hudson Bay." ASSAM BASE - After a long, long time of waiting, a real dance came to this advanced base recently and girls, ice cream and music made the waiting worthwhile. the day Room was termed the "Rainbow Room" and Pfc. John H. Clay and Sgt. Burr Jensen decorated the room fittingly as T/5 Cecil O. Jornlin painted lovely ladies on the wall. Mrs. Kate Lawson, local Red Cross director, thrilled the boys with her staff of Red Cross girls. 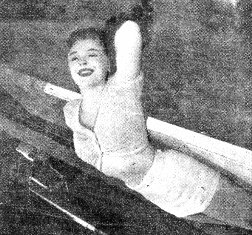 Miss Dorothy Judge, of the ARC, played the piano, as G.I. music was rendered by Vic Caruso's orchestra from the hospital. Vocalists included Cpl. John Newman, Cpl. John Syndow, Cpl. Jimmie Lovett, T/5 Albert Hunter and T/5 Tommie Lillard. Miss Maureen Batty, ARC, was made honorary PFC of the unit at a ceremony read by T/5 Stephen A. Cannizzaro and prepared by Pvt. Ephraim P. Goodman. Capt. Nathan L. Shiffman did the honors. It was a hugely successful evening and the boys have Miss Batty, T/5 Jornlin and Pvt. Lawrence J. Revoir to thank for most of the planning. Khaki-clads in CBI have gone all out for forming home-state clubs. In the past several weeks, men from the New England states and from New York have organized, and have held dinners. Now, a third group will make it's appearance on Nov. 7 at 4 p.m. in a Delhi hotel. All officers, nurses and enlisted men from the State of Oklahoma are invited to attend. It is hoped that the guest speaker will be a lieutenant from Oklahoma who was in the drive on Sicily some weeks ago. The men hope to save up enough beer to make the reunion a gala occasion. Organizers of the club request that men from Oklahoma in the field write to either Capt. 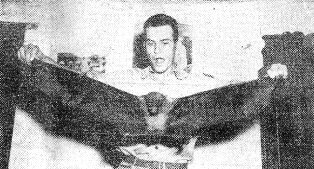 Victor O'Neil or Maj. Bert Johnson, APO 885, so that the letters may be read at the meeting. 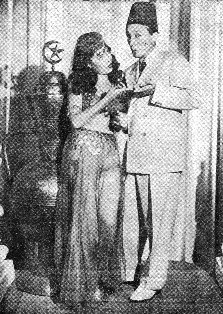 THE GLAMOROUS EAST Dona Drake and Bing Crosby, appearing in "The Road to Morocco," gave movie audiences a true-to-life picture, no doubt, of glamorous North Africa. Next we're hoping to see them in "The Road to Ledo," because we'll be interested to see just what Hollywood can do with the subject. WASHINGTON - Coal, fuel oil, gasoline and tires continued to be major American headaches this week, but news from the food production front indicates that a great victory is being won by America's farmers and victory gardeners. 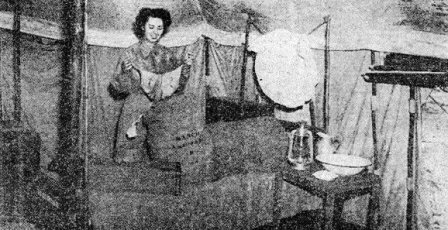 Testifying before the House Agricultural Committee, War Food Administrator Marvin Jones gave the first official outline of the 1944 program, which, he said, should result in the largest food production in U.S. history. He added, however, that due to growing lend-lease and armed forces requirements, additional production will be necessary next year if civilian food supplies are to be maintained at current levels. In another statement, the lend-Lease Administration announced that 6,579,400,000 tons of food have been shipped to the fighting front in the first eight months of this year. Part of the credit for the 1943 increase in food output and a basis for next year's predicted record-smashing production, goes to America's victory gardeners. Secretary of Agriculture Claude Wickard announced that 4,000,000 acres are now in cultivation by gardeners and that 8,000,000 tons of food will be produced from this source this year. On the rubber front, the OPA this week made used tires available for passenger car owners who use their cars at least partially for occupational travel. At the same time, however, Donald M. Nelson, WPR chief, expressed a fear that the 1944 tire program may be seriously retarded by inadequate supplies of cotton and rayon. Pipelines have relieved the fuel oil situation in the eastern states to some extent but new troubles are arising from a critical coal shortage, which is forcing suspension of conversion of oil burning equipment to coal burning. The coal situation undoubtedly will grow worse because of the current coal miners' strike. Secretary Ickes this week terminated the nationwide regulations of gasoline stations' hours of operation, but urged all dealers to establish local limitations voluntarily. He said that lifting the ban was designed to prevent any shortage of facilities serving war workers.